Pepper season is finally upon us. Here are two recipes that showcase sweet red peppers (such as the Carmen, pictured above, from Fazenda Boa Terra in Farmington, Minn., and purchased at the Bloomington Farmers Market), as outlined in this week's Market Watch. Note: From “Fields of Plenty” by Michael Ableman (Chronicle Books, $35). Prepare a charcoal grill, or preheat a gas grill. Place peppers over high heat and grill, turning as needed, until charred on all sides. If peppers still feel a bit firm, place them in a large bowl, and cover bowl tightly with plastic wrap (the residual heat will finish cooking them). If peppers are already tender, set aside to cool to room temperature. When peppers are cool enough to handle, peel back blackened skins with your fingers. Discard skin, core and seeds. 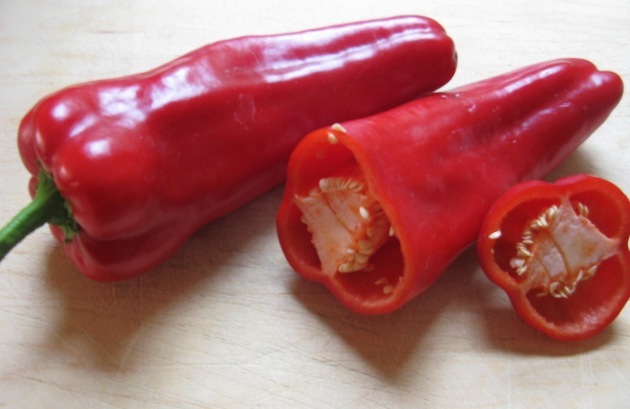 Cut or tear peppers into strips about 1/2-inch wide and place them in a medium bowl. Add garlic, parsley, oregano and olive oil. Season with salt, cayenne and red wine vinegar to taste and toss to combine. Serve as a topping on freshly grilled bread rubbed with a clove of garlic, or as an appetizer with olives, cured meats and crusty bread. Note: This recipe must be prepared in advance. From “Outstanding in the Field” by Jim Denevan (Clarkson Potter, $32.50). Preheat oven to 450 degrees. Wash potatoes, place them in a pot over medium heat and cover with cold salted water. Bring to simmer, reduce heat to low and simmer, uncovered, very gently, so skins do not break and until potatoes are tender and can be easily pierced with a knife, about 30 minutes. Drain and set aside to cool. While potatoes are cooking, place peppers on a rimmed baking sheet and roast in oven, turning them over once or twice, until skins are blistered, 35 to 40 minutes. Transfer peppers to a large bowl and cover with plastic wrap for 10 minutes. Remove plastic wrap and let peppers cool. When they are cool enough to handle, remove and discard skins and seeds (do not rinse peppers, or you will wash away some of the roasted flavor). Cut peppers into 1/2-inch wide strips and set aside. Meanwhile, place minced shallot in a small bowl and whisk in vinegar and 1/2 teaspoon salt. Let stand for 10 minutes. Whisking constantly, pour in olive oil in a slow, steady stream until all has been added and dressing is emulsified. Place fennel seed in a small, heavy skillet over medium heat and toast until fragrant, about 4 minutes. Remove from heat and let seeds cool slightly. Transfer to a mortar and crush seeds very well with a pestle. Cut potatoes in half lengthwise or into 1-inch cubes. In a medium bowl, gently toss peppers and potatoes. Add dressing, crushed fennel seed and fennel fronds and mix well. Season with salt and pepper to taste. Set aside at room temperature for at least 1 hour to incorporate flavors before serving.